Reflect! Re-charge! Re-new! and Re-invigorate! Make 2017 the year you invest in your relationship and engage in meaningful experiences with your partner! It’s a New Year. Valentine’s day is just around the corner. Instead of spending hundreds of dollars on one day of celebration, why not attend a couple’s weekend retreat where you will acquire useful and lasting knowledge, tools and skills. In my experience as a relationship therapist, supported by growing research evidence, I have found that shared experiences enhance a couple’s relationship more than material things, as they provide longer-lasting moments of pleasure, connection and joy. 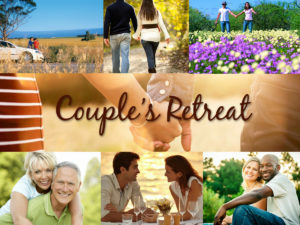 In a small group weekend retreat you will have the opportunity to meet other couples who share your goal of striving for a better relationship. Whether you are in a similar or different stage in your life and your relationship, you will be able to share experiences and learn from each other, creating hope and growth. The focus of the retreat is your relationship and your connection to each other and the theme is “stillness, calmness and clarity”. Consistent with this, we have been fortunate to secure a group booking at the heritage listed New Norcia Hotel. The peaceful and relaxing environment, will provide an opportunity for you both to take a weekend break from the ‘hustle and bustle’ of city life, away from the stress and pressure of your regular lives and free from the elements that act as barriers to communication and connection. The retreat will include workshops on key areas such as developing effective communication, managing conflict, maintaining safety and respect, and developing trust. Through the use of mindfulness based strategies, it will incorporate experiential activities and practical exercises. You’ll learn essential skills on how to cultivate emotional and physical intimacy as you have uninterrupted time to spend with your partner without the distraction of kids, chores, electronic devices and internet…just time to relax, reconnect with your partner, and restore a sense of balance in your relationship. Deisy is a qualified, accredited and highly experienced relationship therapist. She has worked with hundreds of couples in Australia and overseas and has written, conducted research and presented, on the topic of couples at national and international conferences. Deisy is known for her warmth, empathy and insight and her ability to; effectively communicate with both her female and male clients; connect with their individual needs and strengths, and support them in developing a collaboratively crafted shared goal.